A sign like this was outside Longstanton Golf Club however it was too dark to read it, never mind take a photo. On Tuesday the 20th of November 2012 I attended the Swavesey police priority setting meeting. As the first local police priority setting meeting since the election of Graham Bright as Cambridgeshire’s Police and Crime Commissioner I expected him to be there, but he didn’t turn up. The area covered included Grantchester, Longstanton, Girton, Bar Hill, Papworth, Willingham and Over and other villages. Those present included parish councillors and neighbourhood watch representatives, ie. people who given Mr Bright’s campaign I would expect him to be interested in hearing from. While Mr Bright wasn’t present, Mr Fuller, the recently retired Cambridgeshire Police community engagement officer, was there and he appeared to suggest that he was interested in becoming one of Commissioner Bright’s “field officers”. Mr Fuller reported to the group on Mr Bright’s policy statement, which he has made since being elected, promising increased resources to speedwatch volunteers. As well as Mr Bright not being present; Cllr Johnstone, who it has been suggested may become his deputy, wasn’t there either despite her own ward being covered. The primary issue discussed was Tesco in Bar Hill. The meeting was told most of Bar Hill’s crime is Tesco related, there are thefts from the shop, people driving off without paying for petrol, and the police are working with the store following well publicised terrible robberies of elderly people in their car park. The police told the meeting that Tesco, like other major retailers, consider crime from a business point of view and factor in a certain level of loss. The police said they had met local managers who said they don’t get investment from the company centrally in crime prevention unless they are one of the worst stores for crime in the country. The police said they were taking an approach of working with the store but trying to insist that the store do their bit too. The police said the store had cut the number of security guards it employs. Inspector Savage questioned some aspects of Tesco’s operating proceedure, for example why when they spot someone they think will shoplift inside the store do they let them get outside before going after them. The Inspector appeared to be suggesting they could do more to prevent the theft from occuring, rather than simply observing it happen, and questioned the nature of targets Tesco security guards might be working to. During the meeting Clare Welford tweeted asking why Tesco don’t take payment for petrol before letting people have it. Sgt Rogerson responded to say this too was a business decision, because if they took payment first people would be less likely to go into the shop and buy additional items which are more profitable than the petrol. Burglaries in Bar Hill were discussed; these involve UPVC door and windows being damaged, though the police were unclear if this was coincidental and simply reflected the fact most homes in Bar Hill have such doors and windows. The police reported that no repeat offenders lived in Bar Hill and the crime was almost all committed by people coming in from outside. One person present called for the Parish Council to install ANPR on the single road into the village; to help identify these criminals coming in from outside. Lighting in the recreation ground had been raised by young people in Bar Hill as elsewhere; rats on the recreation ground were also mentioned. Sgt Rogerson said he had seen one and tweeted to admit he: “ran like a girl”. HGV drivers parking in a manner which causes other drivers inconvenience as they pop into Tesco was mentioned; there were calls for double yellow lines. 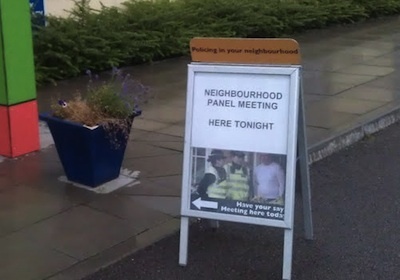 Nineteen members of the public and five police officers in uniform (some were PCSOs) were present at the start of the meeting, with other people arriving late. The police came in three marked police vehicles. A detailed report was prepared for the meeting, it was available in hard copy, but has not been placed online. A member of the public other than me requested it ought be placed online. Sgt Rogerson said that in cases of bank fraud a crime has been committed so he is happy to record it. This is interesting as typically now the police refuse to accept or record reports of such crime. 74 under 17s responded to survey in advance of the Swavesey Police Panel meeting. Lack of lighting making areas feel unsafe was there top theme. Those present did not prioritise acting on it, though the police promised to follow it up and report back to those who responded. In relation to busway crime a criminal ASBO is being sought which will require the subject to stay at least 5m from any cycle rack. Insp Savage noted that continuation of PCSOs (or not) will be matter for the Police & Crime Commissioner. Sgt Rogerson said that the way the force deals with Speedwatch (volunteers with speed guns) data is improving; he said it was now, as of ten days ago, being processed centrally (avoiding the need for PCs and PCSOs who’re not expert in such things having to import lots of data into Excel and try to make sense of it and draw graphs). The police said they were targeting those who purposely speed up though speed watch speed checks. A dispersal order for boy racers in Papworth is awaiting approval (or not) by South Cambridgeshire District Councillors. The meeting was told the order has been drafted so it could be extended to other areas. A councillor said the public in Papworth’s main concern was that there would be a serious accident and those involved could be badly injured, the police agreed this was the main thrust of the calls and correspondence they had received on the matter. The police also said the problem appeared to be getting better. Swavesey has lots of police attention, apparently due to active neighbourhood watcher Polly Wilderspin. There had only been twenty-two recorded crimes in the village in the last quarter, these were listed, they were mainly “rural crimes” eg. diesel theft and interestingly five of the twenty-two were things which police officers on patrol had come across rather than them being reported to the police by the public. There had been one assault on someone by a stranger in Willingham in the quarter. A PCSO had happened upon this happening and related to their presence an arrest was carried out a couple of hours later. The offender has been sentenced to two years in prison. Youths had been asked if the police were approachable; the police reported they had got the full spectrum of responses to that question. The police noted concerns had been raised in relation to Longstanton Parish Council however Sgt Rogerson said “nothing which needs investigating has yet been reported”. Cllr Reynolds said he is a dog walker. Concern about burglaries in Dry Drayton was raised, there are 1-2 per quarter, but it’s a small place. The police said certain Mercedes models were being targeted for catalytic converter theft but Mercedes are not helping the police warn potential targets. Peddlers licences (for door-to-door trading) were discussed. Sgt Rogerson said he is yet to see a genuine one. Insp Savage suggested one resident had been silly sending £10,000 to Spain to pay for a car he had been promised would be delivered, but had not been. He questioned what the police were supposed to do in cases like that. Priorities were set, however with no information from the Commissioner it was not clear if they would take effect for more than the just over 24 hours before he formally takes up office. The priorities were set by Inspector Savage summarising the meeting then asking if there were any ojections. There was no representative democracy, no vote of elected councillors. This entry was tagged Crime, Democracy, Graham Bright, Police, Police and Crime Commissioner, Speeding, Tesco on November 21, 2012 by Richard Taylor. It’s “Mercedes” not “Mercades”. I always thought shops had to let suspected shoplifters leave the premises before stopping them, otherwise they have a defence that they were “just about to pay”. I’ve corrected the spelling of Mercedes and left the comment above in the interests of transparency. I agree the shop are probably allowing the offence to occur, perhaps in the hope the offender can be prosecuted; however the police are arguing back saying the shop ought try and prevent the crime occurring in the first place. (Crimes look bad for the police,; and also sometimes the shoplifters do get away when they make a run for it out the shop and the shop loses lots of money’s worth of stock – so the police wonder why the shop policy appears to be to give the thieves a chance to get away with the loot). @rtayloruk Tesco have shown us CCTV where they watch 3 males take half hour to steel laptop,they don’t call us until they have run out door. My reference to ‘field officers’ was part of a bit of banter with a contact from Longstanton. interesting thought though. I agree, this is an interesting point and it would be very interesting to know (i) how typical this figure is and (ii) how this figure changes as the number of patrols varies. As it stands, it appears to support the “we need more bobbies on the beat” lobby (I am not passing a value judgement here, merely observing). Graham Bright also failed to turn up to the swearing in ceremony at police HQ on 22 November where about 30 new police officers were taking their oath. The PA always came to this – to welcome them with the Chief Constable to the force. Allegedly, [potentially defamatory material removed - RT]. Sends an interesting message about priorities and what is, and is not, valued. If I were one of the new cops, I would be insulted that on the day when policing in the country changed more dramatically than just about any time since the creation of the first bobby, the man in charge was [potentially defamatory material removed - RT]. Very interesting comments regarding the crimes in Swavesey being picked up by patrolling officers. No one seems to have given thought to the fact that many patrols are not random and that a number of those directed, are regularly community information led. If this information had not been forthcoming, a number of these crimes mentioned would not have been picked up! Neighbourhood Watch works.